Difference between revisions of "Chrysler Centura"
'''Chrysler Centura (KB/KC). 1975–7 (prod. 20,000 approx.). F/R, 1981 cm³ (I4 OHC), 3523, 4015 cm³ (I6 OHV).''' Australianized Chrysler 2-Litre in response to [[Holden Torana]], hampered at the beginning by a strike, where French bodies were left on Australian wharves. Car launched a year late, after bodies’ exposure to sea air. Centura 4 similar to French 2-Litre, but with drum brakes at rear. Centura 6 featured locally made Valiant six-cylinder engines (215 and 245 in³). Revision in 1977, creating KC series. '''Chrysler Centura (KB/KC). 1975–7 (prod. 20,000 approx.). 4-door sedan. F/R, 1981 cm³ (I4 OHC), 3523, 4015 cm³ (I6 OHV).''' Australianized Chrysler 2-Litre in response to [[Holden Torana]], hampered at the beginning by a strike, where French bodies were left on Australian wharves. Car launched a year late, after bodies’ exposure to sea air. Centura 4 similar to French 2-Litre, but with drum brakes at rear. Centura 6 featured locally made Valiant six-cylinder engines (215 and 245 in³). Revision in 1977, creating KC series. Chrysler Centura (KB/KC). 1975–7 (prod. 20,000 approx.). 4-door sedan. F/R, 1981 cm³ (I4 OHC), 3523, 4015 cm³ (I6 OHV). 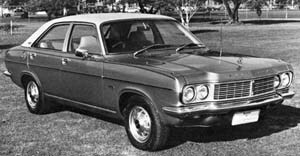 Australianized Chrysler 2-Litre in response to Holden Torana, hampered at the beginning by a strike, where French bodies were left on Australian wharves. Car launched a year late, after bodies’ exposure to sea air. Centura 4 similar to French 2-Litre, but with drum brakes at rear. Centura 6 featured locally made Valiant six-cylinder engines (215 and 245 in³). Revision in 1977, creating KC series.